Blackburn Rovers look set to win the battle to sign departing Hibs midfielder Dylan McGeouch, according to the Daily Mail. READ MORE - In cold light of day will Lennon do a U-turn on leaving Hibs? 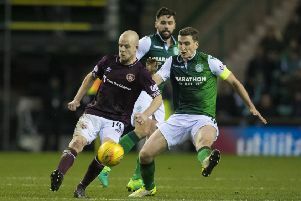 The 25-year-old is out of contract at the end of the campaign and manager Neil Lennon confirmed that he would be leaving Easter Road in the summer. McGeouch, who won the club’s Player of the Year award this term, has been at Hibs since 2014. He initially joined on a season-long loan from Celtic before the move was made permanent the following campaign. Former Hibees boss Tony Mowbray is looking to tie up a deal to bring him to Ewood Park for next season as Blackburn look to compete in the second tier of English football. Aberdeen were credited with an interest but could not compete financially with Rovers. Meanwhile, Rangers have been credited with an interest in McGeouch’s midfield partner John McGinn. The club’s talisman will soon enter the last 12 months of his contract and is expected to be sold on this summer.